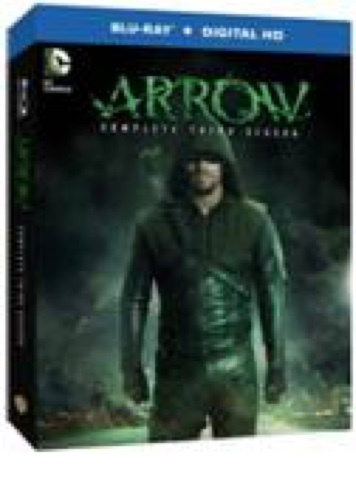 GenreOnline.net: ARROW: THE COMPLETE THIRD SEASON Available on Blu-ray and DVD September 22, 2015! ARROW: THE COMPLETE THIRD SEASON Available on Blu-ray and DVD September 22, 2015! Arrow stars Stephen Amell (Private Practice), Katie Cassidy (Gossip Girl, Melrose Place), David Ramsey (Blue Bloods, Dexter), Willa Holland (The O.C. ),Emily Bett Rickards (Flicka: Country Pride), Colton Haynes (Teen Wolf, The Gates), with John Barrowman (Desperate Housewives, Doctor Who), and Paul Blackthorne (The River). Based on the characters from DC Comics, Arrow is produced by Bonanza Productions Inc. in association with Berlanti Productions and Warner Bros. Television, with executive producers Greg Berlanti (The Flash, Everwood, Brothers & Sisters), Marc Guggenheim (Eli Stone), Andrew Kreisberg (The Flash) and Sarah Schechter (The Flash).